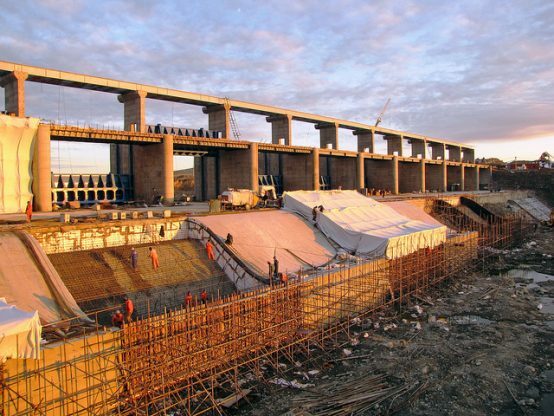 Construction of Intumak Dam on the Nura River, Kazakhstan. Infrastructure projects often have significant environmental and social impacts. Credit: World Bank. 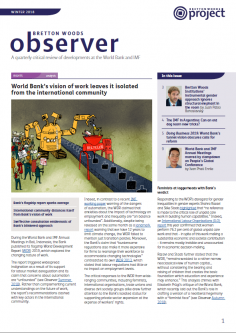 After years of preparation, the new World Bank safeguards for project lending – the Environmental and Social Framework (ESF) – came into force on 1 October, amidst lingering concerns that they will dilute the Bank’s environmental and social standards at a time when it is pivoting towards more risky project lending. The rollout of the new ESF occured after the Bank’s shareholders agreed a general capital increase (GCI) in April for the International Bank of Reconstruction and Development (IBRD) – the Bank’s middle income lending arm – and the International Finance Corporation (IFC) – the Bank’s private sector investment arm (see Dispatch Spring 2018). The GCI will increase the Bank’s lending volume. The Bank will undertake more relatively risky lending in fragile and conflict-affected states (CAS) and lower-middle income countries, and will continue efforts to ‘de-risk’ and mobilise private sector investment (see Observer Summer 2017). Despite a long period of consultation between 2012 and 2016 (see Observer Autumn 2016), and an extended process of creating ESF guidance notes for borrowers (see Observer Summer 2018), many civil society organisations (CSOs) remain unconvinced that the reform of the Bank’s safeguards has been for the better. The World Bank’s new ESF includes ten new core ‘standards‘ with guidance notes for borrowers and ‘best practice’ notes for staff developed over the past two years to guide the ESF’s implementation. It will apply only to the Bank’s new project lending, not to existing project loans or to the Bank’s development policy lending. The new framework includes a ‘use of country system’ provision, which stipulates that safeguards of borrowers may be used for Bank-funded projects if they are ‘materially consistent’ with the new ESF. Given the difficulty of assessing country systems – and the complexity of monitoring implementation of safeguards in such systems – CSOs are concerned that the widespread use of borrower systems could lead to a considerable dilution of safeguards in Bank-financed projects. Horta added that, “civil-society organisations…are increasingly being threatened in many places. Indeed, activists run great personal risks when they campaign to protect vulnerable minorities and the environment from the detrimental impacts of large infrastructure projects,” funded by the Bank and other international financial institutions (see Observer Winter 2018). Indeed, at a Civil Society Policy Forum event on the ESF during the World Bank and IMF Annual Meetings in Bali in October, Indonesian CSOs complained that under existing Bank safeguards, military police were often present in consultations about World Bank-financed projects, raising fears of reprisals for those who spoke out against proposed projects. Later in October, a proposed World Bank geothermal project in Indonesia attracted widespread opposition, with Indonesian CSOs claiming that the environmental and social assessment of the project was inadequate. Given the challenges confronting the new ESF, CSOs remain unconvinced that it is fit for purpose if the Bank is to deliver on its mandate to implement policies that benefit the poorest.